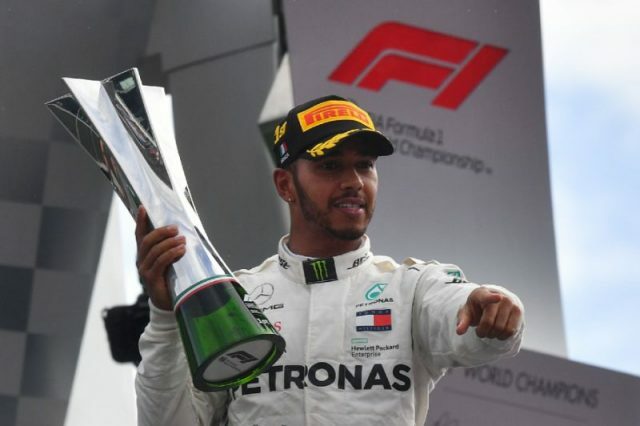 Championship leader Lewis Hamilton delivered one of his greatest races Sunday when he wrecked Ferrari’s homecoming party as he stormed to a record-equalling fifth Monza victory at the Italian Grand Prix. The defending world champion produced a perfectly-judged race of raw aggression and astute tyre-management in his Mercedes to finish 8.7 seconds ahead of Kimi Raikkonen, who had claimed pole position in a Ferrari front row with the fastest lap in Formula One history. The Briton’s 68th career victory and sixth this year stretched his championship lead from 17 points to 30 ahead of Sebastian Vettel, who finished fourth in the second Ferrari after spinning on the opening lap following a clash with the Briton as he passed him at the second chicane. Hamilton’s Mercedes team-mate Valtteri Bottas came home third ahead of Vettel with Max Verstappen taking fifth place in the classified result, after finishing third on the track, following a time penalty for a late brush with Bottas. The Briton’s fifth win in Italy brought him level with seven-time champion Michael Schumacher in the record books, but his triumph was unpopular with the massed Italian fans. “I want to give it up to Ferrari who put up a great challenge and gave us a great fight,” said Hamilton. “I want to thank the guys here and everyone back home – without their belief it wouldn’t have been possible. Within seconds, he passed the German on the outside at the Roggia chicane. Taken by surprise, Vettel could only under-steer into the Briton’s sidepod before spinning off. A safety car was deployed, enabling Vettel to pit for a new wing. Racing resumed on lap four as the stewards announced they were taking no action, declaring it a “racing incident”. Vettel was carving his way through the field and rose to seventh by lap 20 when Raikkonen pitted, handing the lead to Hamilton. “It’s hammer time, Lewis,” Mercedes told their driver as he sought to build a lead worthy of a pit stop. “Nice work,” said Mercedes as Hamilton surged clear of the Finn by 1.5 seconds. “Take care of the tyres, we need to bring the car home,” said Ferrari.